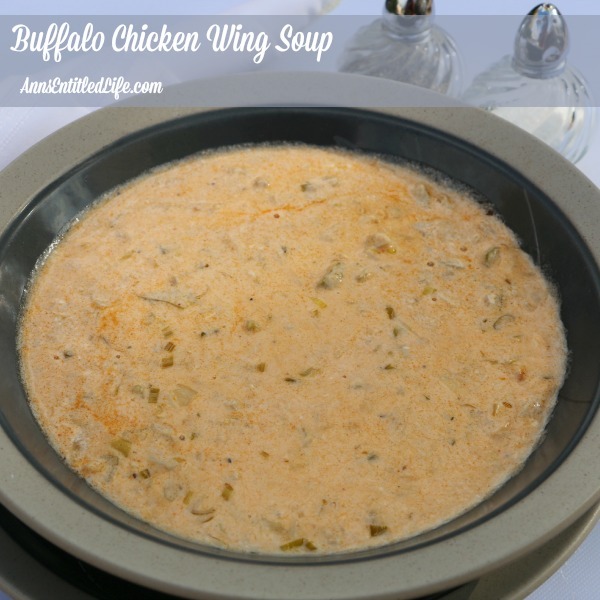 Spicy, zesty and totally delicious, enjoy the great taste of Buffalo-style wings without the mess with this delicious Buffalo Chicken Wing Soup Recipe. • Over mediun heat in a large pot, melt butter and then saute onions and celery until soft, approximately 5 minutes. • Stir in flour until smooth. • Slowly add milk, then broth, stirring constantly until smooth. • Add remaining ingredients, and simmer stirring regularly until cream cheese is melted. • Taste for seasoning. Add more Cayenne Pepper if you want more heat. • Allow to cook until thoroughly heated through, and hot. To print the Buffalo Chicken Wing Recipe, click here. As many of you know, I am from Buffalo (and still live in a ‘burb). Wings were invented at the Anchor Bar in Buffalo back in the 1960s. We grew up ordering pizza and wings as a quick party food, comfort food, or just for dinner. Buffalo-style wings have become so popular, that went my parents were in Singapore 10 years ago (or so), the waiter asked where they were from, they explained Buffalo, NY and they pointed to the Buffalo Chicken Wings selection on the menu! The story takes a turn for the odd when the waiter didn’t realize that Buffalo was a place… I often wonder how many people think a buffalo has a wing… Anyhooo when they couldn’t make him understand that Buffalo was the location the recipe was named after, and not a part of an animal, they finally told the waiter “Niagara Falls”, and he was satisfied. About 20 years ago or so, a local restaurant: Danny’s, started making Buffalo-style Chicken Wing Soup. It was a smash hit! For years they were the only place around you could get this type of soup. They would serve it on occasion as one of their four soup and salad bar offerings. Apparently they heard from their patrons just how much they liked it because now it is a regular there. If you mention Danny’s Restaurant to anyone local, they all say, “OMG Danny’s Chicken Wing Soup! !” and start to drool. Yeah, it is that good. And I think Hubby’s recipe is better. The soup in the photo is made with turkey. We had turkey leftover and I saw no reason we couldn’t make the Buffalo Chicken Wing soup with that instead of chicken. So use chicken or turkey and make this Buffalo-Style Chicken Wing Soup! You will be glad you did. I’m making this soup, low carb style. I love this recipe. I hope you enjoy it, Tamona. Every time Hubby make it, I enjoy it so…. Mine was real thick? It doesn’t look thick in picture? Heat it, Cheryl. It is very thick (I’ve eaten it as a cold dip) until hot, then it thins out. This is seriously my favorite thing right now! Soooo delicious! Perfect for fall/winter. The perfect amount of spicy. I only had one block of cream cheese so I improvised with a can of cream of chicken. Very, very yummy! Thank you for the recipe. I am so glad you liked it, Jonna! Does anybody know if this is good to freeze? Cori this freezes fabulously! Hubby has made it a lot, and we freeze some every single time. Defrost in refrigerator, heat (we reheat in the microwave) and serve. Thank you Ann. I just made this tonight for the first time. I figured there would be a lot but not this much! It is just me and my 8 year old :-). I will be freezing some. Thank you for responding so quickly. I hope you like it as much as we do, Cori! I made this soup today using de-boned chicken wing meat from the Suoer Bowl party. I added water to the skin and bones I removed to make the broth then strained it. I halved the recipe as my husband is not a big “wing” fan but I think he is going to love this!